Ages & Stages Questionnaires®, Third Edition (ASQ®-3) and Ages & Stages Questionnaires®: Social-Emotional, Second Edition (ASQ®:SE-2) are highly effective screening tools for determining whether young children are developing at an age-appropriate level, while identifying parent concerns. These tools help providers do the important work of identifying kids who may benefit from further evaluation and intervention. But what about kids whose scores don’t necessitate referrals to pediatricians, mental health professionals, or early intervention services? Or whose parents want ideas for how to support their children’s developmental and social-emotional growth? Order your copy of ASQ-3 Learning Activities today! You may have heard of ASQ®-3 Learning Activities, which has been out for a few years, and now the long-awaited ASQ®:SE-2 Learning Activities & More is also available. The books were designed to complement and serve as a follow-up to the ASQ-3 and ASQ:SE-2 screening tools—especially for children whose scores are in the monitoring zone. Learning activities are an easy-to-use, low-cost, and highly engaging way to move seamlessly from screening to supporting ongoing child development and promoting closer parent–child interactions. ASQ:SE-2 Learning Activities & More is now available! Each book is structured a bit differently, but both include tons of fun and simple activity ideas that parents can try between screenings to help their children make progress in certain developmental or social-emotional areas. All materials are written at a fourth- to sixth-grade reading level, so they’re accessible to a wide range of parents. 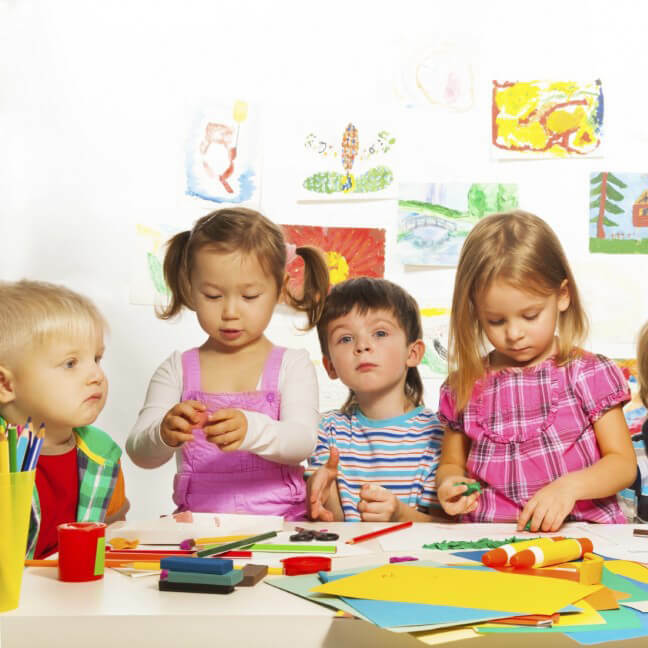 ASQ-3 Learning Activities offers more than 400 activities (about 30 for each age range), which correspond to the five developmental areas as ASQ-3: communication, gross motor, fine motor, problem solving, and personal-social. ASQ:SE-2 Learning Activities has 90 activities (more than 10 for each age range), as well as a variety of additional resources—newsletters for parents that explain social-emotional development; age-specific tip sheets on sleeping, feeding, and calming; and handouts that address topics like child care, stress, and toileting, which are linked to social-emotional development. Each ASQ Learning Activities book comes with this informational letter to parents. Copy and share to introduce learning activities and reinforce the importance of child development. Families of children whose ASQ-3 or ASQ:SE-2 screening results indicate that development is on schedule, and with whom you want to follow up. For example, when meeting with Maria’s parents to review her 24 month ASQ:SE-2 results, which were below the cutoff, her child care provider gave her parents the 21–27 month activity sheet and newsletter, plus the feeding, sleeping, and calming tip sheet for Maria’s age range. Use this handy chart to identify the appropriate ASQ:SE-2 Learning Activities handouts for children’s age range. Families of children whose ASQ scores indicate the need for monitoring. For example, George scored in the monitoring zone for Fine Motor on his 12 month questionnaire. When his home visitor, Elizabeth, shared results with George’s father, she gave him the Fine Motor activity sheet for 12–16 months and asked him to try to activities with George. Elizabeth planned to have George’s father complete the 14 month questionnaire in another 2 months to monitor his development. Families who share general concerns or questions during the screening process, regardless of their children’s total scores. For example, at Isaiah’s 30 month well check visit, Dr. Cameron reviewed Isaiah’s ASQ-3 and ASQ:SE-2 results, which indicated his development was on schedule. However, Isaiah’s mother expressed concerns about how little her son is sleeping. 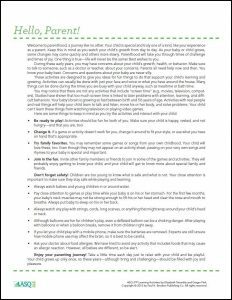 Dr. Cameron shared the Helping Your Toddler Sleep tip sheet with Isaiah’s mother and provided some suggestions about how she can establish a healthy bedtime routine. Families of children with scores in the referral area (below the cutoff on ASQ-3 or above the cutoff on ASQ:SE-2) but found not eligible for services. For example, Alex scored below the cutoff in the Communication area on the 18 month ASQ-3, but after a full evaluation, he was not found eligible for early intervention services. Alex’s Early Head Start teacher gave his parents the 16–20 month Communication activity sheet, along with the activity sheets for the other 4 areas, and asked them to work on the activities at home. As with the entire ASQ system, there is flexibility with how you use these resources to support families. You may need to clarify, reframe, or adapt some of the information to make it more accessible to a family or more compatible with their values or parenting practices. 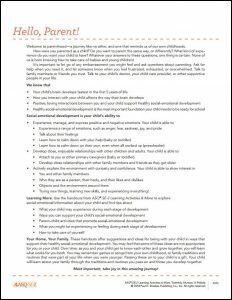 You can use the activities to help guide conversations with parents about their child’s development and upcoming milestones. 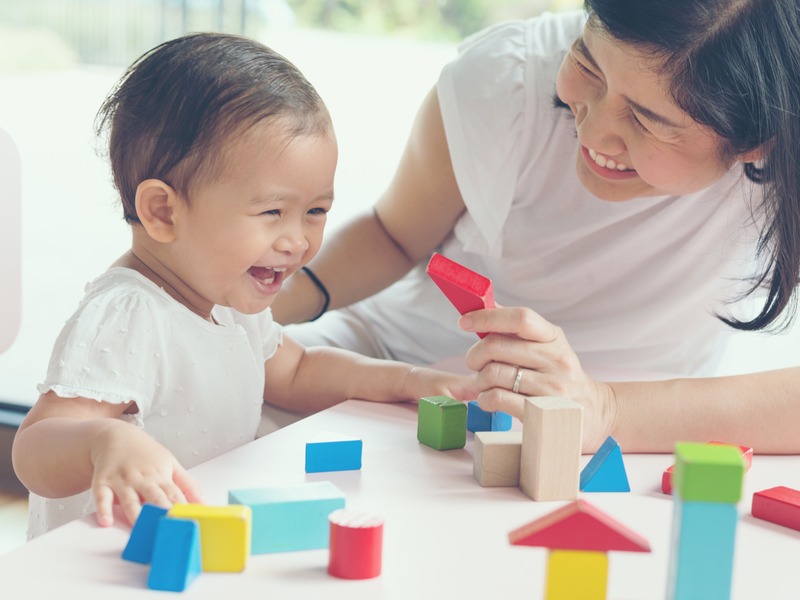 By sharing these activities with families, you’re providing additional information and reinforcing parents’ efforts to support their child’s development. Share through ASQ® Online—Simply enter the keycode on the front inside cover into your account. Then, you can add the handouts to ASQ® Family Access thank you pages or document packets that you print for families. Get more details about what’s in each ASQ Learning Activities book and order your copy today! 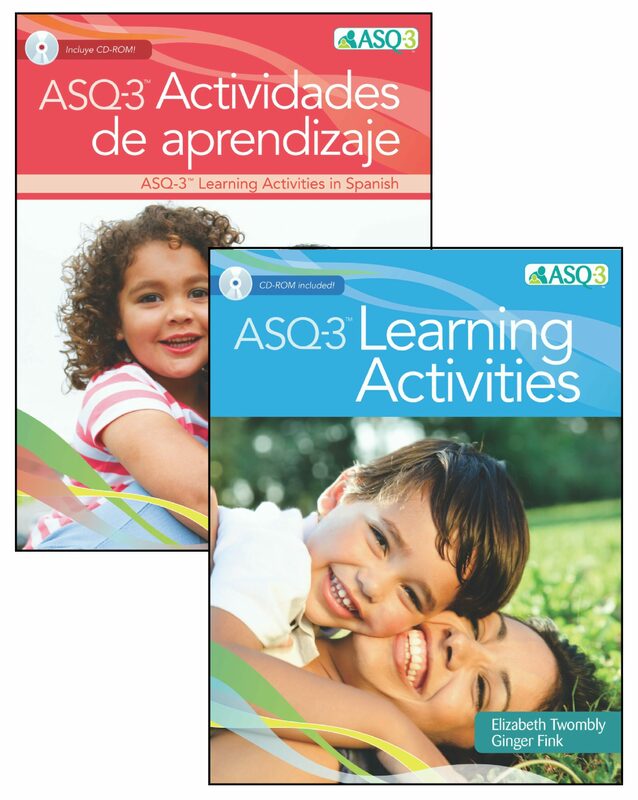 ASQ®-3 Learning Activities is available in English and Spanish. 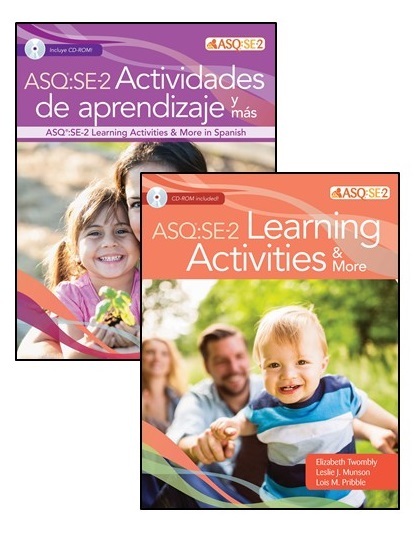 ASQ®:SE-2 Learning Activities & More is available in English and Spanish.